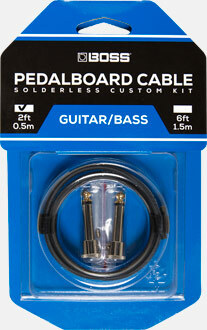 The BOSS Solderless Pedalboard Cable Kit is designed to save space without sacrificing tone. Easy to assemble and no cable stripping required. Their compact bi-directional connectors are engineered to allow straight or right-angle connections, and enable you to place your pedals as close as 1 cm apart. Premium 24K gold plated contacts ensure the most precise sound reproduction available. The low-capacitance, studio-grade cable is ultra-pliable for clean cable management, and is manufactured with oxygen-free copper and braided shielding for quiet operation and lasting durability. © Strait Music Company 2015. All Rights Reserved.